Watford Internet Football Club, or WIFC for short, are a team of Watford Supporters who play teams of other football supporters in a national league run by the Internet Football Association, and are well established as one of the leading lights of the IFA. Formed in 1997, more than 280 players have worn the cherished yellow shirt, and we have competed in over 630 matches against like minded football supporters. If you would like more information about our club, and would like to join us, please feel free to browse this website and if you’re a Watford FC fan, with a regular internet connection at home or at work and are interested in playing for the club, please send an Email to watfordifc at gmail.com and we’ll be in touch. Our current home venue is Parmiters School in Garston. The WIFC management team for season 2015/16 is..
Tom is now in his second season in this pivotal role, and is also our main contact point for the IFA. He is also responsible for the weekday running of the club, collecting subs and communications to the team. Chris has stayed on as treasurer having stood down from the team manager role in 2014. Matt has continued running the pontoon since stepping down from the fixtures role in 2012. Dave will be sorting out the social side of things once again, starting with the awards and quiz nights and keeps the stats and website ticking along. Aidy is the main admin and designer of the website. WIFC Pontoon is your chance to WIN WIN WIN!! It’s better than the lottery as we will pay out 80% of entry fees! It’s better than a raffle, as you will not win something naff that you didn’t want anyway! What can you win ….. cash! And lots of it! What will it cost you? Just 50p (ish) per week! At the start of each game you are drawn a team at random from the English leagues. Each week we take what was originally allocated as your teams fixture for that weekend as your teams qualifying game. For every goal your team scores you get a point (fixture cancelled / no game = 2 points), i.e. 3 goals = 3 points. The aim is to be the first team to reach 21 points without going bust / over, i.e. if you are on 19 then 3 is no good to you and you go bust. The first person(s) to reach 21 wins the Prize Fund based upon the number of weeks for that game. 100 people x 50p x 8 weeks x 80% = £320 !!!! Not bad for 50p per week is it!! And don’t forget that is just one game! A full season should provide you with at least 5 opportunities to win! NOTE: Each game commences with a new draw so if you do not like your team then you will not be stuck with them for the whole season! Here are a few frequently asked questions about WIFC that are not covered elsewhere – please read and drop Rich, Dave or Moz an Email if there is something we need to add, or if you have any comments. Q. How much are subs and when should they be paid ? Subs are currently set at £5 per game and MUST be paid before kick-off to whoever has been noiminated ito collect. Failure to pay may result in not being selected to play. There will be an additional £1 added if subs are paid late for any reason. Q. Is there an annual signing-on fee ? Not as such – the £25 fee for playing at Worldnet and £5 matchday subs are set at the level they are to ensure the club has a float to pay for things like matchballs, kit, pitch/referee fees and website hosting as we go along. The club also runs a pontoon competition to raise extra funds and all full squad members are expected to enter, as well as fully support any additional fund-raising exercises we undertake. Q. What happens if I owe WIFC money ? We will periodically issue a list of monies outstanding for each player. If the amount becomes too large, we will discuss each player’s outstanding amount with them and arrange payment over a period of time. In extreme cases we reserve the right not to select players that owe money to the club so please be aware. If you’re in any doubt about how much you may or may not owe, please drop Chris an Email. Q. Is Injury insurance provided by WIFC ? In a word, No. Because the IFA is not linked to, and is not recognised by the FA, insurance companies will not touch us as a club. The IFA is not willing to persue becoming officially recognised as this would mean members of the IFA committee having to take on the responsibility of adhering to the numerous rules and regulations of the FA. We would also then also have the issue of paying league fees for all the administration that would result from this. All this means it is the responsibility of each player to ensure they are adequately covered against a nasty injury. As the IFA gets a little more serious each year we encourage everyone to, at the very least, look into the costs. The IFA is not like Sunday League and is not run as such. You play for WIFC at your own risk and each of us needs to consider the implications of a bad injury. Q. What is the difference between a full squad player and an associated player ? The full squad system allows those of us running the club to have a bit of control on how many active players we have. We know that some people would prefer not to have the hassle of being expected to reply to availability threads, and we don’t want the hassle of chasing those people down every week. Basically, anybody who has a squad number and player profile on the website is considered to be a full squad player. Being a full squad player means that you understand that whether you’re going to be available much or not is irrelevant but you are happy to commit to replying to all availability threads that go up on here, continuing to play in the IFA spirit and generally being an active player for the team. Most importantly, this DOES NOT mean that anyone who is an associated player is not welcome to play – far from it. Any associated player, be they new to the club, retired, semi-retired or just unable to commit to the conditions above is more than welcome to make themselves available for any WIFC match or event. As said above, we just need to know who our fully active players are. Q. How do I stay, or become a full squad player ? Going forward, full squad players will need only appear in one game during a season or at Worldnet to retain full squad status, assuming you reply to every availability thread. If we don’t hear from you on a regular basis, or you finish a season without an appearance, don’t be surprised if we ask you to give up your squad number ! Any vacated squad numbers will be offered to everyone else. For newer players, once you complete 5 WIFC appearances in the same season you will earn a squad number. Returning players who previously had a squad number and lost it for whatever reason will only need to make 2 comeback appearances in the same season to qualify. Again, these conditions apply in addition to ensuring you reply to every availability thread. If there are any questions/comments about this post, please contact Dave by Email. WIFC are always happy to hear from anyone who might like to join us. New players, especially those under the age of 25, are the future for a club like ours. – Potential new players must be a Watford fan and have a regular internet connection AND email account at work or home. – We prefer to have players that come to WFC games both home and away and will commit to playing as regularly as possible, though there is obviously some leeway on this. – Finally, they must come and play in one WIFC fixture so we can make sure they ‘get’ what the club is here for. Ability is no barrier to playing for WIFC – While we’d like to find a Sean Murray or Aidy Mariappa, we’re equally happy with a David Mirfin or a Liam Henderson. If you are, or know anyone who is a potential new player for the club, please drop us an Email to watfordifc at gmail.com, or send us a message via twitter (@watford_ifc) and we’ll get in touch. Once all of the above criteria have been met, new players will be given access to our closed facebook group and will be added to our e-mail list. What are you waiting for ? Give us a shout..
NB The only time the criteria above do not apply is during those situations when we’re short of numbers and need players to make up an XI. The WIFC ethos is closely linked to that of the IFA in which we play. The aim of the IFA is to build bridges between groups of fans of different clubs by playing a friendly game of football. Though we do compete in a league and its associated cup competitions, and everyone wants to win while wearing the yellow shirt, the focus is on a friendly game of football. For WIFC this means there should be no handbags with the opposition, disputing decisions with referees or linesmen and no back-chat to, arguing with or abusing opponents, team-mates or match officials. If a decision goes against us, the captain will have a word with the referee where appropriate and if you foul an opponent you are expected to pick them up if needed, or shake their hand. WIFC has won team of the year on numerous occasions because teams in the IFA believe we are some of the best blokes to play against in terms of our approach to the game and the banter we provide. We have done this while consistently finishing high in the league and doing well in the cups and Worldnet. By following this ethos we will maintain that reputation. So please bear in mind your responsibilities to our good name, whenever you represent our club. The PSLNet league was a forerunner to the IFA League as we know it today, and in the 97/98 season WIFC finished runners-up. 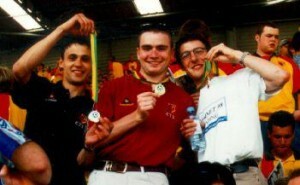 Aidy Spender and Simon Devon show off their medals, which were presented on the pitch at Vicarage Road. 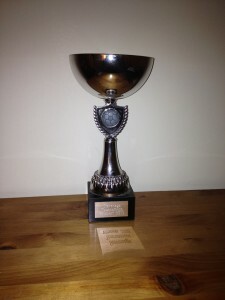 The M’Duck Cup, won in pouring rain in Leicester, back in 2001. The day was probably just as memorable for Wenham’s cracked ribs and lack of a jacket leading to a bout of pneumonia. Wenham himself had scored the 2 goals against Lincoln that eventually secured the trophy. Having beaten Hearts and St Mirren in memorable fashion along the way, WIFC met their old rivals from QPR in the IFA Cup Final in 2002. 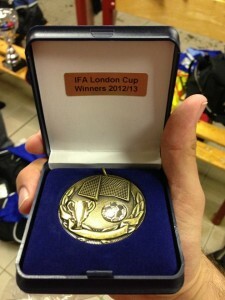 Unfortunately, and despite a man of the match showing from Dave Perahia, QPR ran out 3-0 winners on the day. 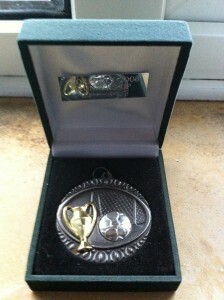 Here is the runners-up medal. The shield below was presented to WIFC on the occasion of the first match against Inter Milan, which took place at Yeading FC in September 2002. The IFA had asked for teams to entertain the Italian visitors and this match was the first of a triple header for Inter. A return visit took place in May 2005. WIFC have always been a leading light in the IFA, and this has led to the club winning the coveted team of the year award on four occasions, in 1999, 2005, 2008 & 2012. 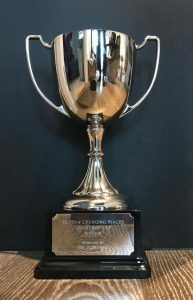 Voted by all other member clubs, the team of the year award is awarded to the team deemed to be the best team to play against in terms of sportsmanship and playing in the spirit intended by the IFA. 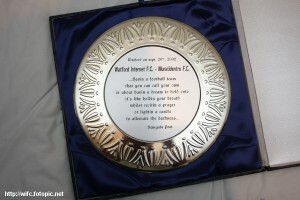 On winning the shield for the third time in 2008, the club were allowed to keep the shield pictured below, and re-name the award after one of it’s own. 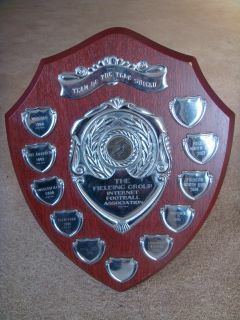 As such, the IFA team of the year now wins the Peter Fincham Shield. 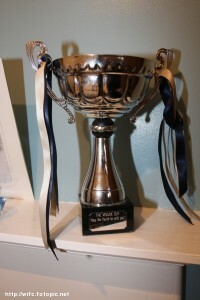 On the back of the team of the year award for the 3rd time, WIFC had their best ever Worldnet in 2008, finishing runners-up to Preston. 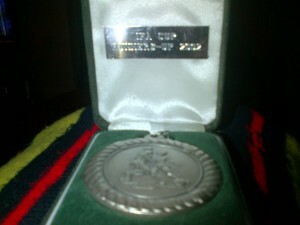 A picture of the runners-up medal is below. This one belongs to Mat Ball. In May 2010, WIFC won their first silverware since 2001 when the club won the Stevenage Tournament. 4 wins from 5 games secured top spot in this mini-league style tournament, in which Paul Whittenbury was named player of the day, as voted by the referees. Defeat in the opening game against the hosts got the day off to bad start, but 4 goals from Jimmy Davis, 3 from Chris Dew and one apiece for Mark Brennan and Alex Prentice accounted for Cambridge, West Ham, AFC Wimbledon and Welling to win the trophy. May 2013 saw Pete Fincham lead a WIFC veterans side to success in Europe, with a tournament win at the Amsterdam Veterans 6-a-side tournament. Rob Sterry was on target in a 1-0 final win against Kingstonian, while keeper Darren Sear won the tournament’s Golden Glove award. 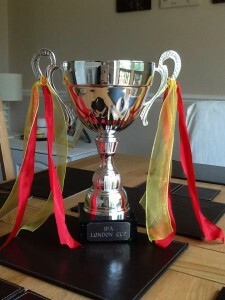 A week after Amsterdam, WIFC made it 2 trophies in a week when they defeated Stevenage in the London Cup Final. Having lost on penalties to West Ham the year before, WIFC were determined to go one better, and goals from Rob Sterry and Stuart Nicholls secured a 2-1 win. 2017 saw WIFC compete in the MKDSA Changing Places Challenge Cup at Stadium MK. 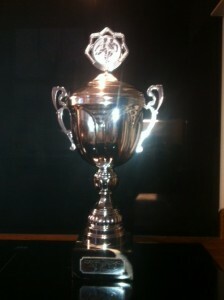 An excellent team effort across the 5 games of the tournament was enough to secure the silverware pictured below.